Le Petit Voilier follows the same eligibility criteria as the Provincial Acadian School Board (CSAP), as defined by the Canadian Charter of Rights and Freedoms (Section 23). There are two categories for eligibility of registration: entitled parents and non-entitled Parents. 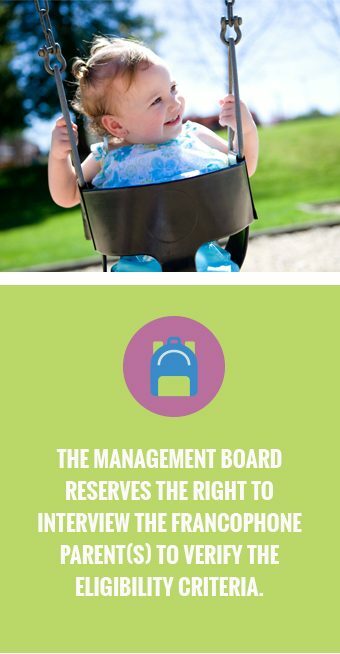 The management board reserves the right to interview the Francophone parent(s) to verify their eligibility criteria. Parent(s) must have completed and sent the CSAP Francophone Schools Eligibility Criteria form and have agreed to withdraw their child from any current child care services within one month following a potential negative response. A child must be between 3 months and 5 years old to be eligible for Le Petit Voilier, or be enrolled in a CSAP school to use the school daycare service. My first language learned and still understood is French. I received my elementary school education in Canada in a French-as-a-first-language program. One of my children was educated at the elementary or secondary level in Canada in a French-as-a-first-language program. Children living with a biological parent who is not an entitled parent and who is currently living with a Canadian citizen with entitled rights (as above).